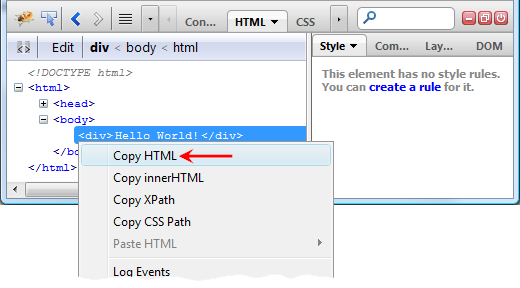 Copy and Paste actions are available through context menu associated with an HTML element. 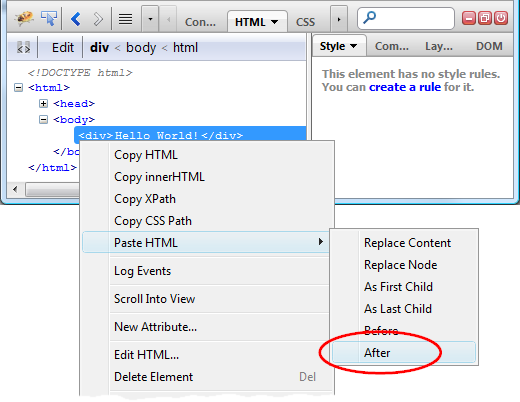 Cut action is actually not implemented, but you can remove elements in the HTML panel by selecting them and pressing Delete key or picking Delete Element from the context menu. In order to copy HTML markup just right-click on an element. You can also right-click on an element logged in the Console panel. You'll get the same context menu. In this example, the <div> element is now duplicated. You can also copy valid HTML markup from any text editor and paste it into the HTML panel.